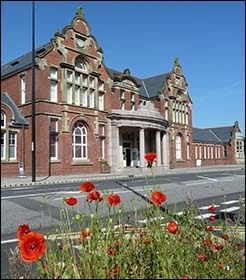 This grand building was erected in 1915-1916 as the General Office of Ebbw Vale steelworks. It would have been even grander, but the First World War intervened. The clock tower at the southern end was supposed to be in the middle of the building’s frontage! 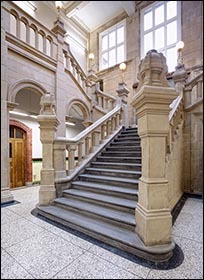 Take a look inside at the imposing staircase (pictured below) and ornate tiling. The building is home to the Ebbw Vale Works Museum, where you can see photos and other objects relating to the area’s industrial history. Iron making in Ebbw Vale began in 1789, exploiting local iron ore. In 1857 the ironworks produced what were probably the world’s first steel rails for trains, on behalf of Robert Mushet, an innovative ironmaster from the Forest of Dean. He gave the rails to the Midland Railway to test near Derby station, where they remained in use for many years – showing steel’s superiority over relatively brittle iron rails. The Ebbw Vale site became a steelworks in the 1860s, adopting Sir Henry Bessemer’s process which blasted air through molten iron to remove carbon. His process wasn’t suitable for iron which contained phosphorus, but Welsh iron ore (which he’d used for his experiments) was unusual in being almost free of phosphorus. The Ebbw Vale Steel, Iron and Coal Company thrived in the early 20th century. There was a setback in 1915 when a fire wrecked the company’s generating station at Victoria. This caused the blast furnaces to become clogged with iron, which had cooled and solidified inside. Women made artillery shells at the steelworks during the First World War. More than 400 men from the works died in service. One of the survivors, blacksmith Jack Williams, returned with several medals including the Victoria Cross, and the company gave him a job in the General Office building plus a home and a lifetime’s supply of coal. A blue plaque in his memory was installed on the building in 2014. In 1967 the steelworks were nationalised. Steelmaking ended in the 1970s and the works became a specialist facility for coating steel produced at other British Steel sites. The works closed in 2002 and the site was cleared for a variety of new uses. In 2011 the General Office building was extended on the western side to provide premises for the Gwent Archives, where the public can view a large collection of historical records.